For those of us that are honest, we will admit that us car folks are not the easiest to buy present for. So Vertar have come to your rescue and have compiled a selection of great gifts that help make your shopping task for birthdays and special events a little easier. Three bag set of custom made luggage for Ferrari F355. All Hills Alive tailored luggage systems share the same features Shaped to fit the luggage space for maximum practicality Fully stiffened so the bags are always the same shape Smart abrasion-resistant polyester material in a range of colours Brushed nylon linings Clip off shoulder strap for ease of carrying Light weight and robust No longer will you struggle to re-pack your car every morning when you are touring. Bespoke custom made luggage for Ferrari F430 and Ferrari 360Modena. All Hills Alive tailored luggage systems share the same features Shaped to fit the luggage space for maximum practicality Fully stiffened so the bags are always the same shape Smart abrasion-resistant polyester material in a range of colours Brushed nylon linings Clip off shoulder strap for ease of carrying Light weight and robust No longer will you struggle to re-pack your car every morning when you are touring. Zymol Complete Kits are a great way to introduce you to a comprehensive range of Zymol car care products. The Zymol Complete kit brings together everything that is included within a Zymol Starter Kit and in addition extra cloths and applicators along with products to care for your wheels, interior conditioning and once the full process has been completed, a quick waxing product which not only cleans away safely mild dirt but also lays down a fresh layer of Carnauba with the minimum of effort. The Zymol Complete kit contains the necessary products to complete the Zymol application but also provides a full size tub of wax to continue in excess of 2-3 years. Based on an average sized saloon car with applications of wax, once a month, which are not necessary. Subject to the correct maintenance routine using Zymol products and wax used. A lower priced quality alternative to the Meguiars G220 Orbital Polisher with the similar featured and specification Kestrel DAS-6 Random Orbital (DA) Polishing machine. The kit includes the pads and compounds you need to rid your car of even deep swirls and scratches, revive the colour and provide a great base to seal in with a quality wax. At its core is the Kestrel DAS-6 Machine Polisher, safe for anyone to use due to its head oscillating rather than spinning on its own axis. This makes it almost impossible to burn through paintwork, though care must be taken on sharp creases. Ordinary, cheaper, rotary machines really are for the professional, so this provides professional power with safety levels suitable for enthusiasts and beginners. Comprises: DAS-6 Random Orbital (DA) Polishing Machine Meguiars #105 Ultra Cut Compound (8oz) Meguiars #205 Ultra Finishing Polish Speed Glaze (8oz) NEW Velcro-backed 7" S/Buff pads: Polishing Pad Finishing Pad Individually, with genuine Meguiars pads these products would cost £157, with the virtually identical Flexipads Worldclass pads, save over £24 from our original price of individual items, or £12 off buying these kit items separately. A collection of fine paintwork care products for correct preparation and maintenance of paintwork on all cars. Kit contains: Soft Sheepskin wash mitt Aqua Bathe ph neutral wash n wax shampoo (500ml) OnePass Microfibre Waffle Drying Towel Signature Series non-abrasive Pre-Wax Cleanser (250ml) 55 wax Microfibre Buffing Sheet Microfibre Pocket Pre-Wax applicator Foam wax applicator Full instructions on each product. Paint Protection Film - in some instances on light cars where shinkage or damage to the film has occured, some slight staining may occur. 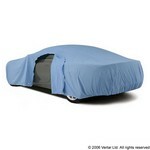 Please contact us prior to order if you have such a car. Zymol Starter Kits are a great way to introduce you to the range of Zymol car care products, or even make a great gift idea. The kit brings together the essential items to complete the basic process of the Zymol application but also provides a full size tub of wax to continue in excess of 2-3 years. Based on an average sized saloon car with applications of wax, once a month, which are not necessary. Subject to the correct maintenance routine using Zymol products and wax used. We’ve all had to swiftly run round our cars to dry them before water spots form, which are very hard to remove and can badly affect paintwork. And try as you might, washing and drying will cause swirl marks and light surface scratching. Existing in-line water filters are either very expensive or have incredibly short lives, and can waste the casing, which is very environmentally unfriendly. For example, the AquaGleem filter is 2.5 litre capacity, typically retails at £55. That’s 54% more expensive than our unit costing you 38p per litre. The Race Glaze unit costs 25p per litre, as supplied with its first fill of mineral-absorbing resin,and only 10p per litre with subsequent refills ! 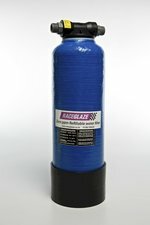 The new Race Glaze Maxi-Filter uses a durable fibreglass tank ready filled with premium A1 grade resin (note: some budget filters use sharps – broken reject resin) and comes ready for you to add standard Hozelock-type connectors to begin use immediately. The tank is pressure tested and certified to 11 bar. Tap water enters the tank and under mains pressure is forced up through the resin bed to emerge on the outlet side as close to 0 parts per million (ppm) of dissolved solids as possible. You can use a pressure washer or just mains pressure, with no degradation of water pressure at the delivery end. And no need to empty when you have finished your wash, just turn off the mains. Using a hosepipe to wash a car uses approx. 30 litres of water (AutoExpress 21/3/2012), a final rinse only a fraction of that – we estimate 5-7 litres at most. This is a breakthrough in filtered water product for car washing that is sure to be very popular. AutoExpress regarded it very highly and featured it as one of their 'Products of the Year' in December 2013. Accessories: Water Hardness Meter so you can test the water to see when resin needs replacing, and replacement resin in 7 litre or 25 litre bags. Note: our £5.95 shipping rate covers mainland UK, for offshore/Highlands/NI please contact us for supplements. Signature Pre-Wax Cleanser (250ml)- a fantastically easy to use cream cleanser to rid your paint of oxidation, stains, surface debris and discolouration, leaving the perfect surface for the wax to bond to. For paintwork with light swirls, the Cut & Cleanse Kit is recommended Pocket Microfibre Applicator for perfect fingertip control and economical application of Pre Wax. Signature 55 Wax (230ml) – probably the best wax to come onto the market in the last 2 years, this soft, oily (and therefore easy to work) wax leaves a dripping shine, not only on dark colours but also whites and silvers. Sufficient to coat 35 cars, and lasting up to 6 months or more, your car will look showroom with this product, which has won numerous prestige Concours events since launch. Yellow wax pad for application – or use hands Clearmist Detailer (250ml)– a carnauba rich maintenance spray wax with gentle cleansing properties to maintain your finish between waxes or upon arrival at events. A quick spray and wipe just peps up the finish a wash too. 2 new Signature Microfibre Polishing Cloths, each superbly soft, 60cm square and machine washable Paint Protection Film - in some instances on light cars where shinkage or damage to the film has occured, some slight staining may occur. Please contact us prior to order if you have such a car. We have been supplying custom made sets of car floor mats in any colour, with matching or contrasting edging, to specifically suit any car, for a number of years. They're British made from high quality deep pile carpet, foam backed, tough and durable. You can customize them to suit your own car - colours, logo etc. A set comprises 2 or 4 mats depending on your car. Our MD has been using a set of these mats since 2007, and has covered 5,000 miles per year - the mats are still in superb condition. Our factory makes mats for some of the most prestigious new car dealerships in the UK, so you can be assured of premium quality car mats at a good price. Customers owning Ferrari, TVR, Porsche and Aston Martin for example have been delighted. Note: we will assume any logo you request is embroidered white on the outside edge of the driver mat as illustrated unless informed otherwise. Copyright logos cannot be added, but model numbers, like 355, DB7, 360 are suggested. Delivery is up to around 7 working days. Note: these will always show on the website as 'In stock' but due to their custom nature allow for manufacture. Few brands conjure up the same status as Ferrari. Finely engineered for both beauty and performance, these evocative automobiles are true works of art — designed for the discerning, and priced for the privileged. This book of fine photography showcases the work of Günther Raupp, long linked to the prestigious marque. 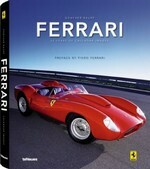 Mr. Raupp has photographed the Ferrari calendar for 25 years now. He lovingly handpicks his greatest work over the decades for this exciting showcase of legendary vehicles. Punchy, informative text leads us into thrilling shots that highlight the dynamism and fine detailing of each unique model. Each of these last few remaining copies are signed as collectors items. Around 30 copies only. A collection of fine paintwork care products for correct preparation and maintenance of paintwork on all cars. Kit contains: Soft Sheepskin wash mitt Aqua Bathe ph neutral wash n wax shampoo (500ml) OnePass Microfibre Waffle Drying Towel Signature Series non-abrasive Pre-Wax Cleanser (250ml) 42 wax Microfibre Buffing Sheet Microfibre Pocket Pre-Wax applicator Foam wax applicator Full instructions on each product. Paint Protection Film - in some instances on light cars where shinkage or damage to the film has occured, some slight staining may occur. Please contact us prior to order if you have such a car. Double brushed for softness and constructed from a poly-cotton that breathes naturally, allowing condensation to evaporate. The fabric is treated to give damp protection and keeps out moisture, thus preventing corrosion, whilst continuing to protect against dust, scrapes and scratches. Door entry points are featured with covered zips on both sides to allow entry whilst protecting the delicate finish of your paintwork. Available in light blue.